I knew where I was, approximately, but the room was dark and unfamiliar. I knew I had tasks to do, but I struggled to recall specifics. With the exception of a small circle of lucidity at the center of each eye, my field of vision was largely opaque, like I was looking through the wrong end of binoculars. Voices, garbled beyond comprehension, diverted my attention. I couldn’t tell whether they were speaking to me, to each other, or to no one in particular. I felt like sitting down. If I couldn’t remember what I was supposed to do, what else could I do? I could sit and stare at the wall and drift off. At least it would pass the time. I started toward the rocking chair, but saw piles of clothes on the bed, and remembered then that one of my tasks was to fold the pillow cases. An otherwise simple undertaking proved difficult, however, as it took great concentration and physical effort just to grasp the fabric. A door slammed. More startling than the suddenness and force of the sound was the question of whether it actually happened, there in the room, or had occurred only in my mind. I shook the thought and pressed on. A thought materialized––something about the checkbook. Was I supposed to write a check or only produce it from the purse? But why would I get it out if not to write a check? And to whom? I found the purse on the counter, its dark contours blending into the darkness of the room. A siren blared and then faded. I took the checkbook out and, not knowing what to do with it, let it fall to the counter. Defeat. Despair. A pervading emptiness. The room stood before me as a projected image of my mind, cluttered with familiar objects and images I couldn’t make proper sense of. I might’ve been able to tolerate the disorientation were it not for the loneliness. How long had I been in the room? How was it that I, a thirtysomething adult in good health and of good mind, had been rendered so incompetent, so unmoored from mental faculties, so … blank? In less than a minute, I returned to my full, able-bodied and able-minded self. 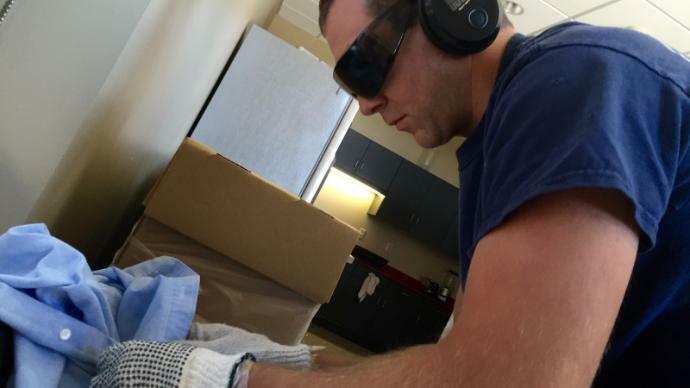 It was as easy as taking off a pair of sunglasses, altered to to restrict peripheral vision; a headset that pipes in noises to confuse the brain; and two pairs of gloves, which serve to diminish tactile sensation. My senses had been compromised for only six minutes; I couldn’t imagine enduring it any longer. It was as if I had become imprisoned in a bad waking dream. Without the ability to sense my surroundings or communicate clearly, simple tasks, meaningful engagement, and even thought became a burden. For those with Alzheimer’s and other dementia-related diseases, such burdens are a daily reality. 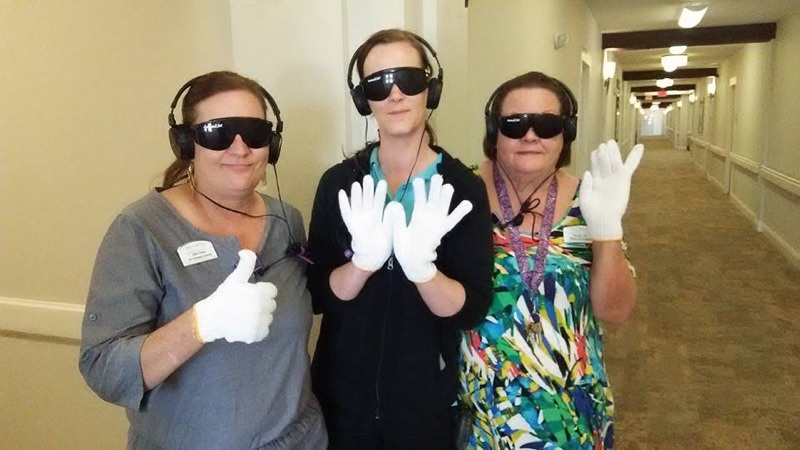 I had just experienced Dementia Live, a training program for caregivers and care providers that simulates dementia’s sensory symptoms and immerses participants into everyday life with its complexities. The training was facilitated by Kim Stender, a franchise owner of Right at Home, In-Home Care & Assistance, at Maple Hill Senior Living in the St. Paul suburb of Maplewood. After putting on the equipment, participants enter the room, personalized as if it were a resident’s. They are approached by the facilitator and asked to carry out a list of instructions (different for each participant) that cannot be written down or repeated. The activity is followed up with a debrief conversation focused on feeling and sensitivity awareness. Rather than expecting those who suffer from dementia––a rapidly growing population––to understand the world as someone of sharp body and mind would, Dementia Live, the flagship program of AGE-u-cate Training Institute, invites family, friends, medical students and care professionals to meet those who suffer from dementia where they are. Informed by “person-centered care,” which puts the focus on the person rather than the illness, the program’s aim is for participants to gain an “inside-out understanding of what it’s like to live with cognitive impairment and sensory change,” Pam Brandon, AGE-u-cate president and founder, says. And while the “wow” experience of the Dementia Live training––so immediately and easily felt––is intended to, in Brandon’s words, give participants the “greater, deeper, raw truth of dementia,” change is made possible only with further action. I left Maple Hill Senior Living and made my way home through Twin Cities rush-hour traffic. The very landscape I had traversed a few hours ago looked different––maddeningly so. I could read the road signs and navigate the clover-leaf on-and-off ramps of the interstate, but with cars abutting my own on all sides, stopping and going at unpredictable intervals, I was increasingly aware of how much intense effort and concentration driving requires. How would someone with dementia make sense of the metropolitan cluster––the innumerable numbers and pointing arrows indicating this way or that, the endless stretch of pavement, the flat expanse of greenery with little variation or differentiating markers? And then I remembered how difficult it was for me, an hour earlier, just to find the training. It had taken me nearly twenty confused minutes, during which I inched more than once toward helpless rage. How would a resident with dementia negotiate the labyrinth of similarly-decorated hallways, Would they be able to read the signs, overwhelmed as they were with numbers and arrows? Would they be able to recall the four-digit keypad code required for entrance to some resident wings of the building? “How are we going to make dementia-friendly changes that will ultimately improve their lives?” Brandon had asked. The question wasn’t rhetorical. The towns and cities we daily navigate, their roads and buildings, are not dementia-friendly. We need practical and innovative solutions that are sensitive to an aging population––not only those who become physically impaired, but also those who become cognitively impaired. Aging Lives, another program of AGE-u-cate, offers a promising start in that it provides education and awareness outreach, including Dementia Live training, to those dealing with the public––bankers and retailers, for instance. Brandon also cites Dementia Village, which started in the Netherlands and now has locations in Italy and Canada. She describes Dementia Village as “cutting-edge communities where people with dementia can live more normal lives,” and she thinks we’ll see more of that model coming stateside. Sheriff Caulk described an incident, prior to Cambridge’s community-wide commitment to Alzheimer’s awareness, involving multiple squad cars engaged in a motor vehicle pursuit. The vehicle finally stopped and guns were drawn, only for the officers to find out that the driver, an elderly male, was suffering from dementia. “This person had no idea, they just had no idea. They weren’t aware of what was going on, and they were probably scared. They were never charged, and it was actually good because we were able to get them help, get them to their family, and get them on their way,” Caulk recalls. “How are we going to make dementia-friendly changes that will ultimately improve their lives?” Again, Brandon’s question lingered. Cambridge, no doubt, has. In fact, nearly fifty communities in Minnesota have heeded the call, as have many throughout the U.S.
Patrick Barry is the son of Will I Be Next? Producer, Therese Barry-Tanner, and the grandson of Helen Paul, who serves as Therese’s inspiration for the film project. He is a high-school English teacher in Minneapolis, where he lives with his wife, Maia, and two sons, Adrian and Otto.